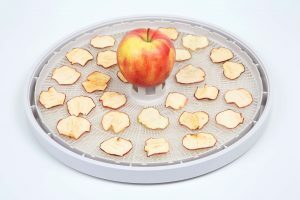 The dehydrator is generally used to dry up fruits, vegetables, and even meat and it can reach the same results as using a regular oven. The key differences between the two, however, lay in the fact that a dehydrator is more efficient and generates less heat. 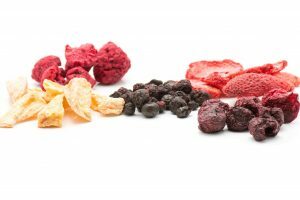 Out of all dehydrated foods, fruits and vegetables are the most popular because they keep a fresh taste and make the perfect healthy snack. 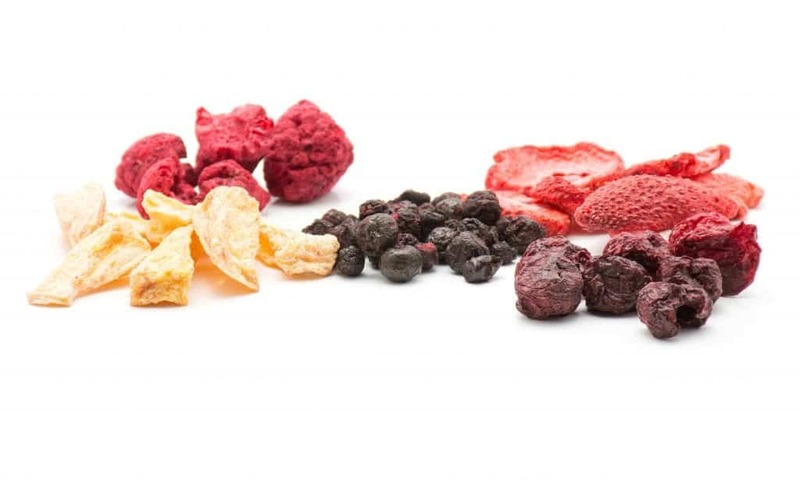 However, dried fruit and veggies that can be found in stores contain a much higher amount of sugar and preservatives than the ones made at home. The first thing to look for is the shape of the device. 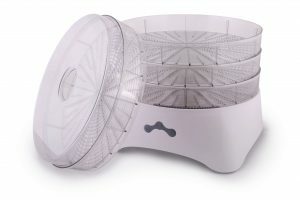 Food dehydrators can be found in both cylindrical and square shapes. 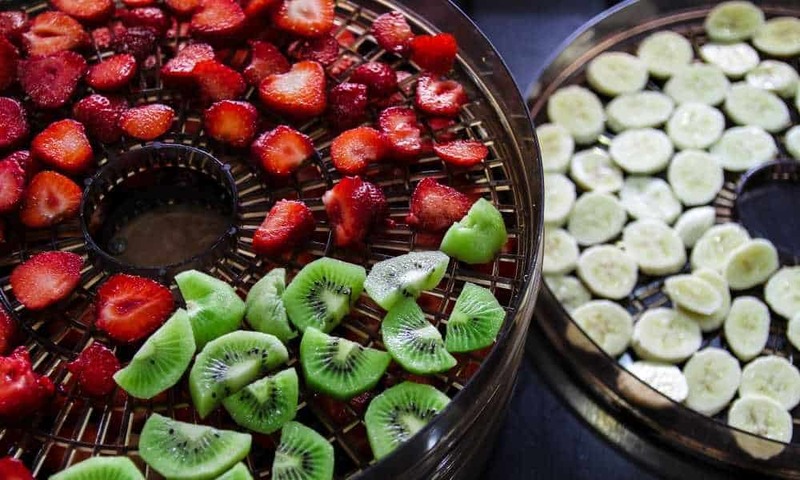 Cylindrical dehydrators are usually more expandable and allow the user to either add or remove trays quicker, depending on the food that needs to be dried. However, as the heat and the airflow are pushed from above, they pass through all the trays which can cause the smell and flavor to mix at times. On the other hand, the advantage of a square dehydrator is that the heating mechanism is located at the back of the device, leaving more room for the food. Because the airflow is horizontal, the flavors of the foods will also no longer be mixed together. 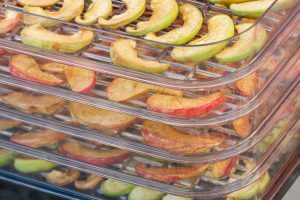 While a cylindrical device will require the trays to be adjusted depending on the food that is drying (the food closer to the ventilator will dry faster), a square dehydrator eliminates this issue as each tray will get the same amount of heat. The part that should factor into the decision is power. A device with 10 trays will need to have at least 500 watts drawn from the outlet, and it is very important to have some sort of temperature regulator. 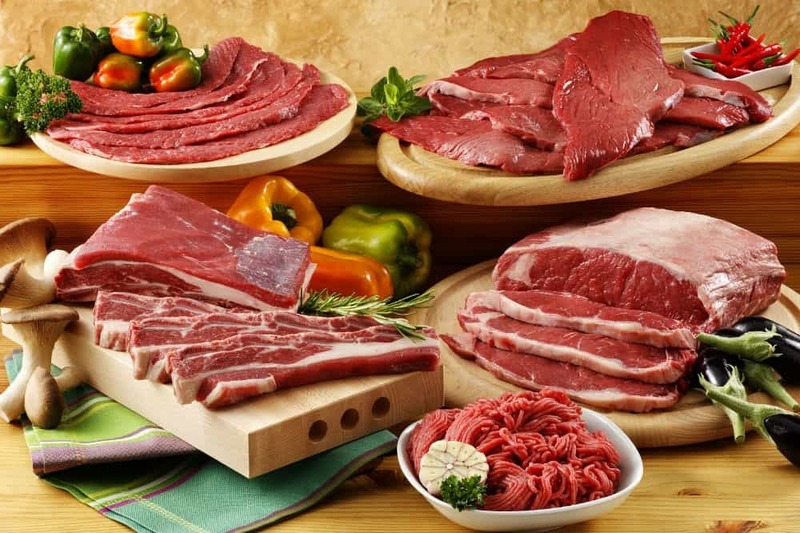 Some types of food require different levels of temperature throughout the drying process. 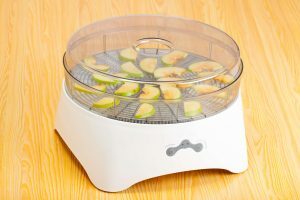 For this reason, a good food dehydrator needs to have a timer and thermostat for the user to achieve the best results. Another important thing to be taken into consideration when purchasing a food dehydrator is the actual material it’s made of. The more affordable devices are made out of plastic and, while they may be enough for the occasional use, serious shoppers might want to invest in a stainless steel product, which is more durable and reliable throughout time. Arguably the most important quality that people search for in a dehydrator is capacity. More often than not, bigger will be better. Because of their design, cylindrical dehydrators are more often than not smaller in storage capacity than their beefier counterparts. Sure, someone who’s looking for casual use shouldn’t be really concerned by size, but people who have a small orchard or veggie garden should consider getting a full-sized product. In addition to capacity, the layout also favors square designs a bit more, since trays are not only higher in number, but can also fit more products. 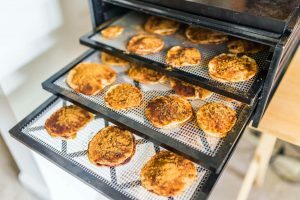 The only downside of owning a bigger dehydrator is that cooking cycles are most likely going to last longer since heat dissipation will take a hit when cooking loads of product at a time. Extra features are one of the best ways of determining which of two products is better. From using stainless steel trays instead of BPA-free plastic to putting that useful transparent panel instead of making a 100% opaque device, these extra features are keys to turning a good dish into a great dish. It’s also important to keep an eye out for things that will make the investment more feasible. Some manufacturers like to bundle up extras to draw clients, extras which can prove to be very valuable to rookie users. From that extra cooking sheet to the cool recipe booklet, everything adds up and increases the value of the purchase. 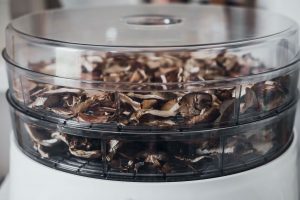 While arguably every dehydrator is pretty easy to use, there are plenty of neat tricks that manufacturers use to make them even more user-friendly. These are great for the beginner since they lower the prep and cook time by quite a bit. A great example of these types of features is marking the thermal thresholds for different types of foods. 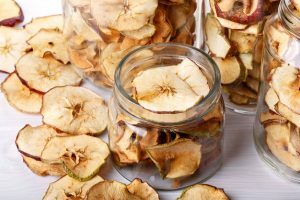 Some dehydrators have the 113 F degree option on the thermostat labeled as “apple chips,” making it easier for the home user to start working on their first dishes without spending a lot of time on research. Sure, aesthetics aren’t that important, but keeping the kitchen all equipped with similarly-looking products can make for a safer, more familiar environment. Relaxation is a very important process in cooking, and one shouldn’t underestimate the Zen of a well-balanced kitchen look. Try to opt for something that blends in with current appliances, even if it will cost just a bit more. That being said, users shouldn’t make a decision based on aesthetics alone, so low-quality products should be crossed off the list, no matter how good they’d look on the countertop. 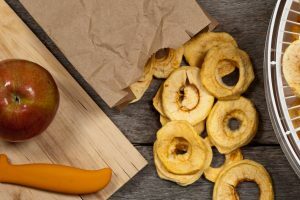 There are a lot of factors that go into picking the right food dehydrator, but the hardest part is to find a product that blends them all into a well-balanced appliance. The best course of action is choosing a reputable brand and quality products. 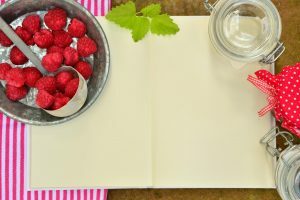 Making healthy snacks at home can quickly turn into a lifestyle, so picking a decent product might justify spending a bit of extra money, as long as it’s going to live long and prosperous and the center of a healthy family. Why Buy a Food Dehydrator?